We’re going to talk about 2 types of yard sale signs today. In addition to neighborhood and directional signs which tell people how to find your yard sale, you’ll also want to hang a number of signs on-site at the yard sale itself to make it easier for people to find the prices and locate similar items by “theme”. Do You Need Signs Throughout The Neighborhood? Yes! 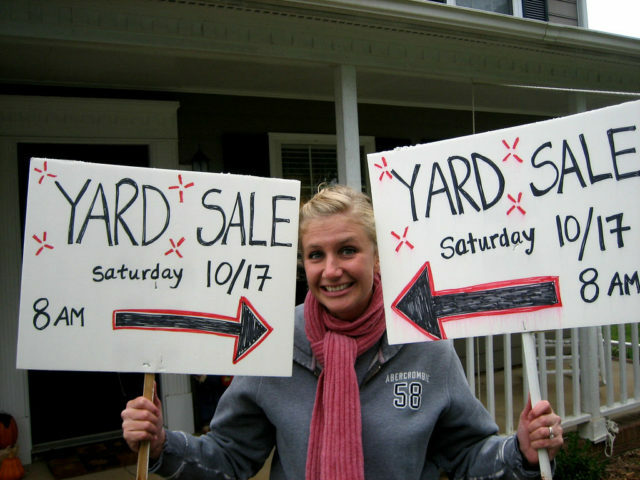 Directional signs through the neighborhood will show people how to find your yard sale — whether they first saw your ad or not. Post your signs leading up to your house the night before the sale. Be sure to make a mental note of all the places you’ve posted signs so you can take them all down after the sale. 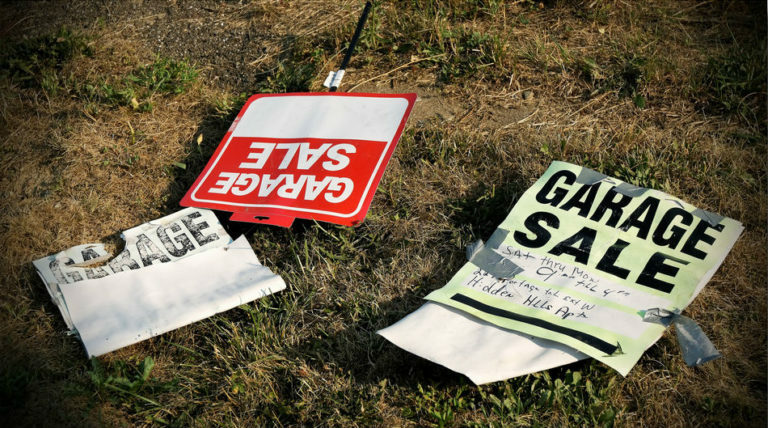 Leaving garage sale signs up after the sale is tacky and junks up your neighborhood. Plus, the signs tend to shrivel up and fall to the ground anyway. And you don’t want to litter! Keep in mind, some areas (like where I live in Franklin, Tennessee) have ordinances regarding garage sale dates, times, and places. Some also have restrictions regarding the placement of signs, so be sure to check with local officials in your area first. For, example, I had to pay a $5 fee to the City of Franklin in order to obtain a yard sale permit. There are some unique privileges & penalties too. So before you go gangbusters creating some yard sale signs, be sure to check your local ordinances. 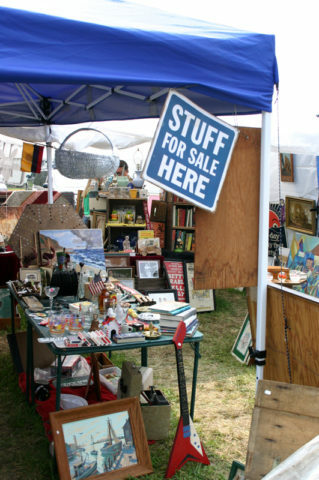 Be sure to look for other areas within your own neighborhood to get the word out about your yard sale. For example, at our community swimming pool, there’s an “info board” for people to post notices. Additionally, you may want to add an arrow pointing toward the direction of your home. Ideally, you would make the arrows separately so they can be applied to the bottom of your informational signs, as they are being put up. Remember, you want your sign to be readable from a long distance away, so use very thick lettering and as few words as possible. Also, the larger your sign is, the better. Posterboard size is best. On most roadways, people are traveling too fast to be able to read whatever is printed on a standard 8-1/2″ x 11″ piece of paper. Tip: No matter the size of your paper or board, try to leave some white space, and only include the “bare necessities” — those few lines of text listed above. Too much information becomes difficult to read. You could also tape colorful posterboard-sized paper (with the details of your sale) to each side of a cardboard box. This sort of 3-D sign attracts a lot of attention! The best colors for yard sale signs are: neon orange and neon green. Why? Because these are bright enough to be seen from a distance away. Brightly colored backdrops like that attract a lot of attention and are highly recommended. 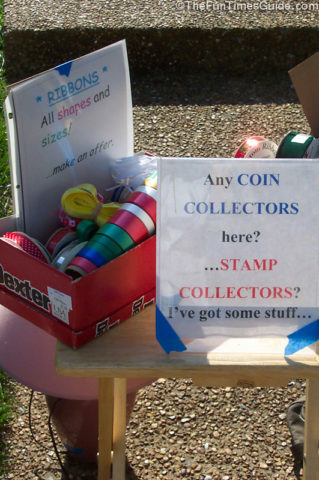 More great tips for making yard sale signs. One thing I like to do is to reuse old political signs and other for-sale-by-owner signs that you or your neighbors might have placed in the yard recently. They’re great because they have the metal step stakes already attached — so they won’t whither away or become unreadable on windy days. You can either cover the old signs with posterboard that you write your yard sale details onto. Or re-paint the background a solid color (like a bright neon green!) and write your yard sale message on that. The best part: you can re-paint or re-cover them to reuse these signs year after year… yard sale after yard sale! 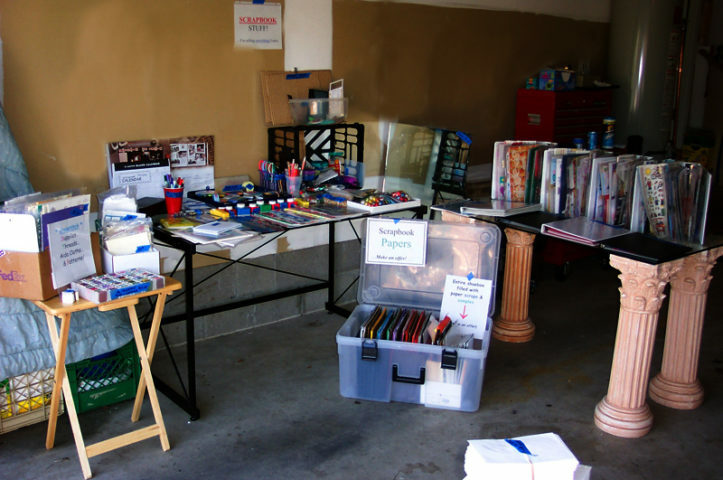 TIP: Cover your yard sale signs with thin plastic bags (like drycleaner bags) to make them weatherproof, or run strips of wide clear packing tape over the sign so your inked message won’t smear if it rains. They’re larger than most signs you could possibly print at home. They’re much more durable and sturdy, therefore, they’re likely to be seen by more people. They’re usually weatherproof (rainproof) and wind-resistant. They’ll last for years — so you can use them for more than one yard sale! There’s a good selection of garage sale signs to choose from on Amazon. Do You Need Price & Category Signs? Most people don’t take the time to make item description signs and larger price signs. But I do. Just don’t put too many words on those signs though, and use thick lettering to make your sign easier to read, especially from a distance. Make your point in as few words as possible. Why? Because people generally don’t “read” signs… they’re just skimming and looking for a word or two that interests them or explains what’s being sold. Coin & Stamp Collectors: Ask me, I have rare coins & stamps. Scrapbooking Stuff… Everything must go! Also, if you have a bunch of something (like dozens of sports posters that are individually rolled up, or different magazines in one big box), then print-out one sheet that says exactly what’s there. That way, people don’t have to flip through everything to see if there’s anything they’re interested in. Found some pictures of us camping with those same tents. Printed the digital images onto plain white paper using my home printer. Slipped the piece of paper into a clear page protector. 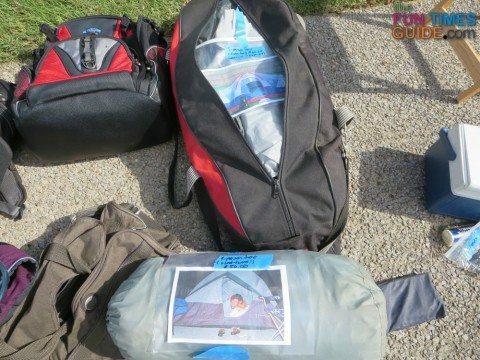 Taped the photos onto the camping tents themselves. Why? Because they’ll stay put! Paper itself is flimsy, it tears, it curls in the wind, and the ink can smear if it sprinkles. Page protectors make your signs practically indestructible. On a windy day, they won’t blow away. On a rainy day, they won’t become soggy and unreadable. No matter what, a sign that’s contained inside a page protector will always lie flat & be easy to read. Page protectors also make your signs reusable — yard sale after yard sale. Another thing that works great because it “props up” your sign for displaying on a tabletop: acrylic frames! Use a piece of blue painter’s tape to tape it to the table top, so it dangles down in front of the table (…with the tape actually showing, because it calls attention to your sign). Tape the sign to a piece of cardboard or a shoebox lid for stability, then toss it on the table (or blanket) next to the items it’s describing. Use a long piece of blue tape to make the sign dangle from your garage overhang. This way, it will flop around and draw some attention on its own. 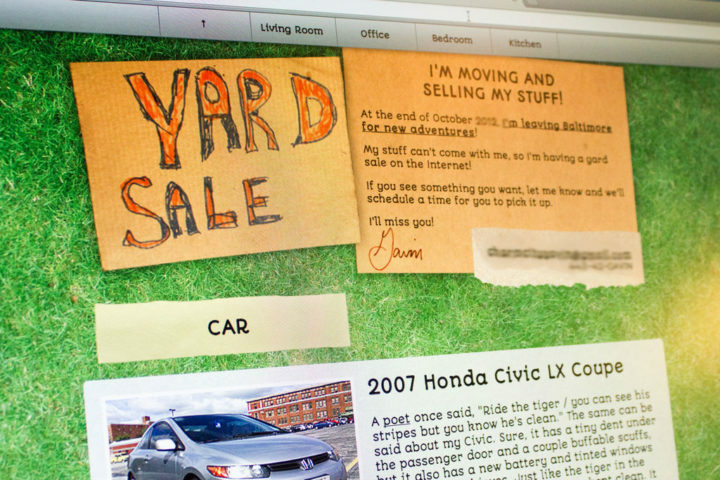 Tape a sign onto the wall inside your garage — if you’re selling any items from inside the garage. Use those small posts & signs that lawn care professionals leave in your yard after they’ve visited. Either prop the stick in a mug or vase on the table next to the items it’s describing, or Stick it in the ground next to items on a blanket that the sign refers to.